A gambling enthusiast from the Netherlands has kicked off this week with a life-changing jackpot. The fortunate casino player in question crammed his wallet with a stunning ₹12.2 crore in cash after a rather remarkable gambling session. He turned multimillionaire whilst spinning the reels of the hugely popular Mega Millions slot machine at one of the Holland Casino branches. Needless to say that the Dutchman was stunned when he struck oil at the Holland Casino in Breda. 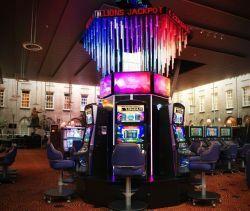 “I decided to hit the casino for a while as I finished work a bit earlier. It was not until much later when I left the gambling establishment with a fat wad of cash in my pockets,” the extremely fortunate gambling devotee commented. Most players at the Holland Casino branches have a weak spot for the progressive Mega Millions slots, which are linked together by a network. There are a whopping five jackpots up for grabs, with prizes ranging from 52.7 lakh rupees up to at least ₹7 crore. Players have to bet 352 rupees or more in order to be eligible for one of the jackpots. Last year, another fortunate gambler cashed an eye-watering ₹15.5 crore when he was playing a Mega Millions slot at Holland Casino.